Cyclesnack: 22 lb, folding Single Speed? 22 lb, folding Single Speed? Found this little morsel on The New York Times Online edition. This is the lightweight (? 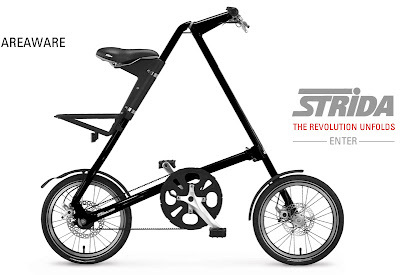 ), ultra portable, rolling when folded Strida. An interesting concept that started out as an Engineering Design project. I question the weight only because lightweight to me would be sub twenty pounds, like somewhere between 10 and 15 pounds. 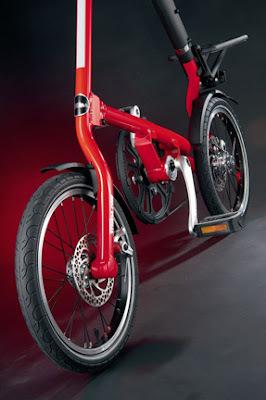 They do have a mini version, which can only handle 175 pounds and that bike weighs 19.8 pounds, the 5.0 version which is made for the US can go up to 250 pounds. Too bad there isn't a fixed version - I would try one of those. Diameter of drive wheel in inches × number of teeth in front chainring / number of teeth in rear cog. For example, suppose the drive wheel is actually 26 inches in diameter. If the front chainring and rear cog have equal numbers of teeth, one turn of the pedals produces exactly one turn of the drive wheel, just as if the pedals were directly driving the drive wheel. That combination of gears and wheel is said to be "26 gear inches." If the front chainring has 48 teeth and the rear cog has 24 teeth, then each turn of the pedals produces two turns of the rear wheel. This is equivalent to doubling the size of the drive wheel; that is, it is like a directly-driven bicycle with a 52-inch wheel. That gear is said to be "52 gear inches." A bicycle with a 26-inch wheel, a 48-tooth chainring, and a cassette with gears ranging from 11 to 34 teeth has a lowest gear of 26 × 48 / 34 = 36.7 gear inches and a highest gear of 26 × 48 / 11 = 113 gear inches. I would assume that the wheels are probably 16 inch wheels and I would think the manufacturer would use a standard front chain ring, my guess is a 52t, so the ratio is probably 52:15. There's $h!t on my leg!